Appetizing cucumbers in sweet and sour marinade – be ready, these cucumbers will taste completely different than cucumbers in traditional marinade. 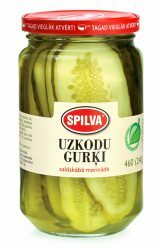 Marinade for Snack cucumbers is made on the basis of Scandinavian beloved sweet and sour flavor. These cucumbers have a slight sharpness due to spice mix of turmeric and nutmeg. Snack cucumbers are cut in slices and ready to use straight out of the jar. They are irreplaceable with sandwiches, for decorating dishes with “roses” or “sails”. These cucumbers are used in the preparation of burgers, hot dogs wrapped them in lavash and cut in meat salads. Shelf life unopened – 36 months. The product is filled 460 ml glass jars. Product 100 g contains: energy value – 64 kcal (270 kJ), carbohydrates – 15 g (of which sugars – 14.3 g), protein – 0.1 g, fat – 0.1 g (of which saturates – 0 g), salt – 1.2 g.